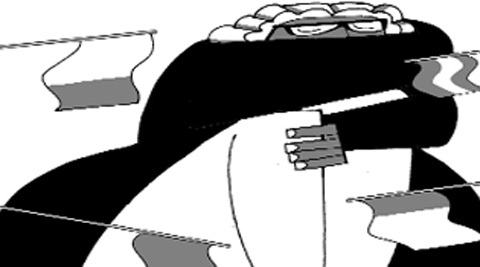 The thesis of ‘committed’ judiciary has been abandoned, but its practice continues unabated. That is the real problem, writes RAM JETHMALANI. A judge is the guardian of the small man and his bundle of rights, which enable him to realise his fullest material, moral and spiritual potential, and expand to the utmost frontiers of his body, mind and soul. No judge must aspire to harmony with the legislature and executive. Every judge must brace himself for a life of tension with both in the intelligent and stout defence of his ward, who needs constant protection against the insolence of unfeeling officials, the venality of politicians and the misdeeds of wicked neighbours and fellow citizens. Every court is essentially a court of wards; the Supreme Court has the entire citizenry as its ward. Our judges need not be sensitive to the oft-mounted attack that they are not elected and are, therefore, unaccountable and undemocratic. This role of the judge makes one think about elected judges. But the system of elected judges has been tried elsewhere and I believe that it has produced jokes. The most instructive joke that you will find is that in a certain US state, the Democratic Party found a judge paralysed from the waist downwards and invariably, in elections, he won the sympathy vote. He triumphed in four successive elections but before the fifth, a Republican Party official said to his superior, “Sir, we have found a solution to our problem.” He asked, “What is it?” The answer: “Sir, this time we have found a judge who is paralysed from the waist upwards.” It will not work in India anyway. Economics may have dominated the world most of the time and probably does dominate in some sense even now. But today, politics has overtaken economics in its influence. In the past few decades, all institutions, including the judiciary and of course the Bar, have struggled with the temptations of politics. Judges, like other mortals, are attracted to politics, particularly aspiring ones who consider favours from a ruling party to be stepping stones for upward mobility in the field. Usually, but not always, judges do often violate their oath of administering justice without fear or favour. Favours done have to be returned, feel some. We have therefore to evolve an effective mechanism of insulating judges against politics and involvement in political machinations of the kind that have disgraced some sections in the past not only in this country, but also elsewhere. South Africa, in its new constitution, adopted the model of a judicial commission as the method of selection, which has been operational since 1996. The law minister is formally consulted and he makes his comments upon the appointees or recommendees of the judiciary. The comments of the law minister are considered with respect and attention, but the final word lies with the commission. I am committed to this mechanism as our final solution. I must hasten to explain why. I agree with the weighty opinion of my erudite friend, senior counsel Anil Divan, in his recent article in The Hindu: “The present secretive process followed by the collegium excludes public scrutiny, violates the citizen’s right to know and leads to diminishing respect for the judiciary.” Some bad appointments produced by this system are also notorious. While corruption continues to grow like a galloping cancer in every branch of life, the judges seem to reciprocate by producing a strange jurisprudence that only protects the corrupt. The law of contempt and the difficulties of proving judicial corruption deter cautious lawyers. But the common man, not so inhibited, produces an impressive volume of popular corruption folklore. The real decline of judicial character started in 1973. Mohan Kumaramangalam, a distinguished lawyer and politician, claimed that judicial appointments could not be made without reference to the social philosophy of the judges. The judge, being an important decision-maker, makes decisions that are bound to affect the lives of the people, and his decisions are influenced by his social philosophy. Therefore, independent India should have judges who are “committed” not only to the social philosophy of the Constitution, but also to that of the government. This was controversial. However, Indira Gandhi’s government implemented his views during the Emergency. Though the Kumaramangalam thesis has now been abandoned, its practice continues unabated. While judges associated with the ruling establishment are invariably appointed, those having any form of association with opposition parties are scrupulously avoided. How successive chief justices, who are supposed to be totally judicial even in the discharge of their administrative function, habitually enter into convenient compromises escapes comprehension. The inevitable answer is the creation of a national judicial commission in which the judiciary, government, opposition, the Bar and academic community have an equal voice. Judges should hold office only during the pleasure of the commission. It should have the power to appoint, transfer and dismiss — of course, in accordance with procedure established by law, or what is also known as due process. The Lokpal may well be a useful addition to the list of participants. The 79th report of the Law Commission suggested ways to plug loopholes in the existing system of appointment of Supreme Court judges. No one should be appointed a judge of the Supreme Court unless, for a period of not less than seven years, he has snapped all affiliations with political parties and unless, during the preceding seven years, he has distinguished himself for his independence, dispassionate approach and freedom from political prejudice. The practising Bar is the constituency of a judge. If he cannot retain its confidence, he must gracefully quit office. It is just not true that only weak and obliging judges are popular with the Bar. Members of the Bar know the black sheep on the bench. No wonder, the American Bar Association can, by its adverse criticism, make the mighty president of the US withdraw his nominees for judicial office. A lord chancellor of England admitted that if he made an unworthy appointment, he could not possibly look into the eyes of the lawyers at Bar dinners.